It sure was nice to be in San Francisco on Tuesday, it was a very nice and sunny day. 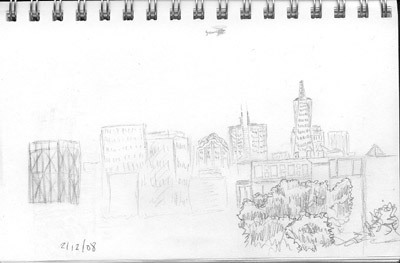 Took a quick trip to the Coit tower, and decided to take the time to practice some more artmaking. 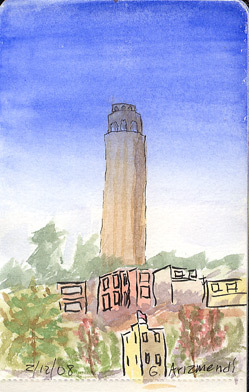 Below is a watercolor of the coit tower. I also started this sketch, but stopped after a while… too many buildings and not enough time. There is a restaurant on the corner of Union and Grant called Cafe DeStijl, I have gone past it but never eaten there (It appears the location is under new ownership). I typically just get water/soda, today however I decided to try their smoked salmon with avocado sandwich.. it was excellent!!! 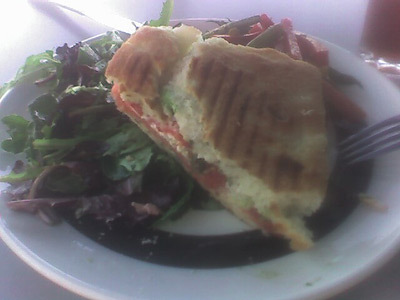 Below is a cellphone picture of the half-eaten sandwich, figured better take a picture before its completely eaten. For those that are wondering, here are the ingredients: smoked salmon, avocado, sprouts, tomatoes and capers on foccacia, served with green beans and carrots. All in all, it was a productive day all around.